"... give yourself something that's going to really contribute to your life, and really make you feel better." 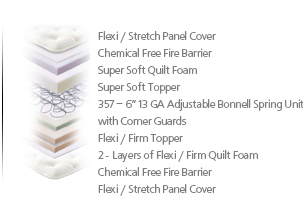 Choose from any mattress type. 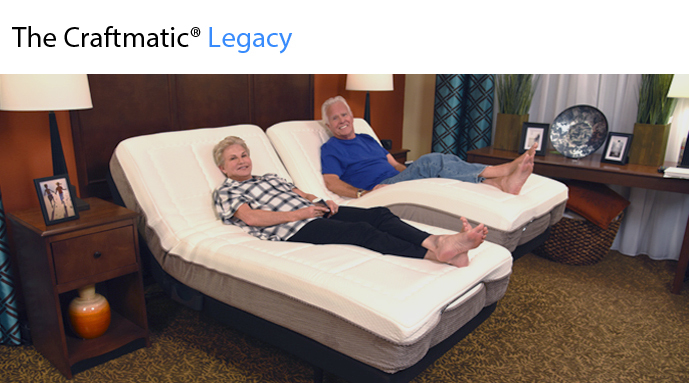 Today's Craftmatic® Legacy adjustable beds Offer more luxury features than you will ever see in other adjustable's. 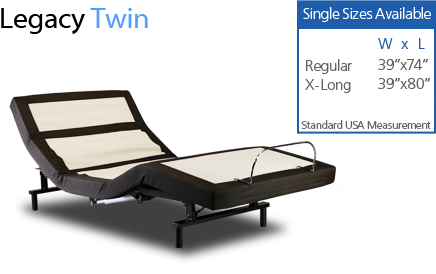 Legacy Model adjustable beds are designed to offer you the Best in Rest for Less! 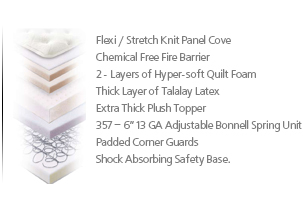 These Superior Legacy Adjustable Bed Systems come standard with our flagship designed dual density coil spring comfort control mattress. That means firm on one side. Plush medium firm on the other. The New Dual Density Mattress has been an overwhelming successful breakthrough designing to help you achieve the perfect solution to a good nights sleep!. Our All New Craftmatic® Legacy Adjustable beds come fully loaded with a technologically advanced Wireless Remote that Illuminates at night - Whisper Quiet Head and Leg motors - Two Zone Full Body Wave Massage with Auto Timed shutoff - A Rising Adjustable Pillow Feature - One Touch Auto Flat Button - Bedside Power Plugs To Charge You're Phones & Tablets - A Child & Pet Safety Lock - 2 Position Programmable Memory - Programmable Zero Gravity Anti Snore Button - LED Safety Night Lights - A Movable Remote Holder and more .... click this link on our website. Whisper Quiet motors allow up to 450 pounds of lifting capacity. The optional heavy duty models allow up to 600 lbs. All Deliveries are made through our Craftmatic® Authorized Delivery and Service network throughout all 50 United States. 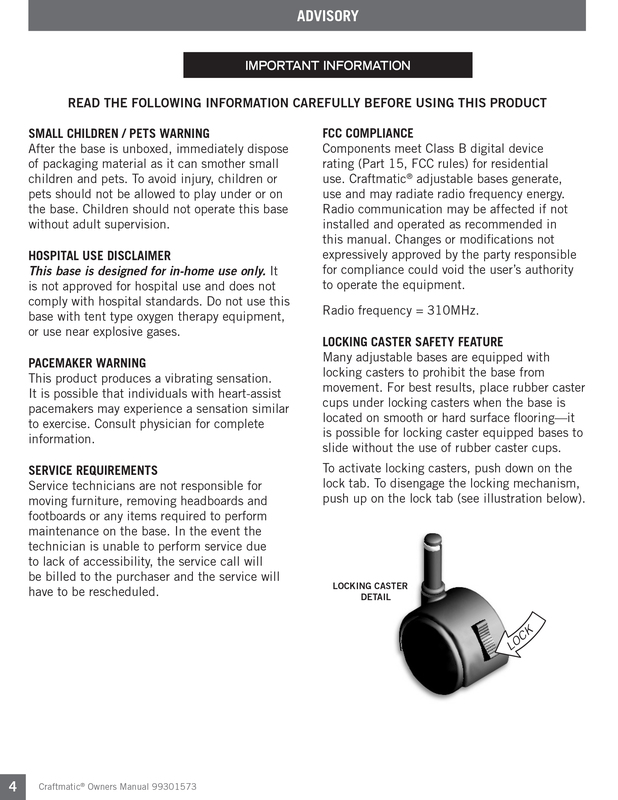 Lifetime Limited Position Changing Mechanism Warranty (includes motors, gears, controls and electrical system) Mattress Warranty: 15 year limited pro-rated mattress and foundation warranty. 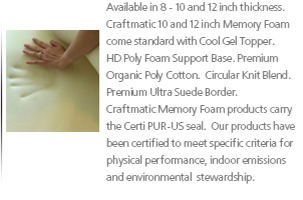 The Craftmatic® Legacy also offers choices of optional mattress designs. 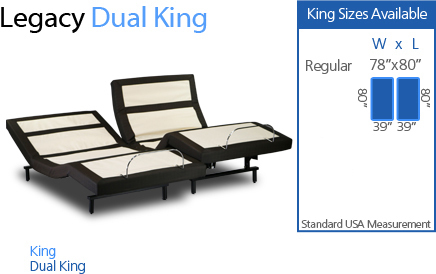 A Dual Density coil spring mattress. Space Age Memory Foam. Latex Plush and a Cool Top Memory Foam Design. 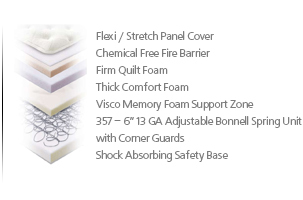 We highly recommend our flagship coil spring comfort control mattresses to over 80% of our customers. We have found that dollar for dollar, quality vs quality today's model I beds offer the perfect combination of features and benefits making it the best value on the market today! Since Craftmatic® beds are designed for maximum comfort and durability your Craftmatic® representative will suggest the right Bed for you and your budget. 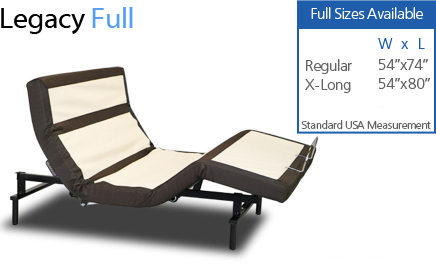 Craftmatic® Legacy Adjustable Beds are available in all popular sizes. 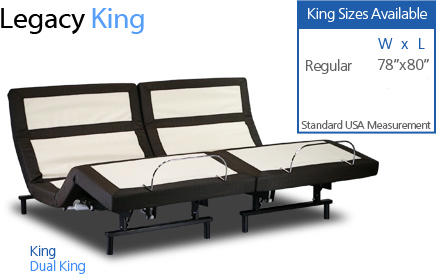 Models are available in: adjustable twin bed, full size adjustable, adjustable king, and queen size adjustable. In the USA, Standard bed length for single and double/full size beds is 74". 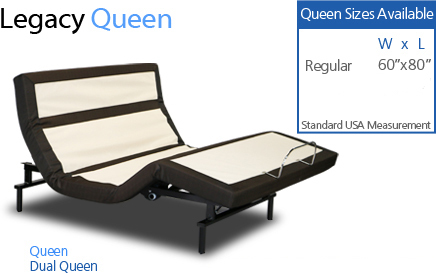 For queen and king adjustable size beds the standard bed length is 80" However, all bed widths are available in 74", 80" and 84" lengths to assure your comfort. You get so much more - for so much less!